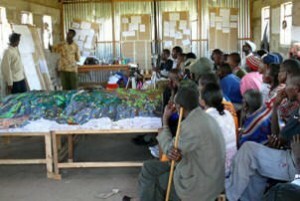 This 1:10,000 scale (2 x vertical exaggeration) Participatory 3D Model of the Mukogodo Forest was completed in December 2007 in Laikipia District, Kenya. The model covering a total area of 57,600 ha or 576 km2 has been the 3rd Participatory 3D Model constructed in Africa. The Mukogodo is one of the last pristine forests in Kenya. 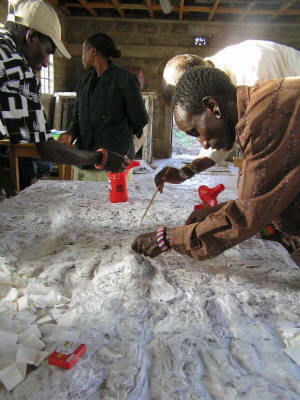 Corruption, logging, uncontrolled agricultural incursion have all taken their toll on the forests of Kenya. Their destruction has placed traditional hunter-gatherer communities in a position of vulnerability and insecurity. IPACC, ERMIS Africa and Shalin Ry have been cooperating with the Yiaku Peoples Association to run this P3DM exercise which covers the area of the Mukogodo Forest. The event has been timely, as there were only 5 known speakers of the Cushitic Yiaku language (also called Yiaku and Mukogodo), making it Kenya’s most endangered language. 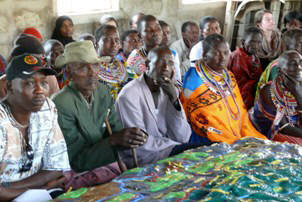 Most Yiaku today speak Laikipia Maa, a nilotic language of herders. During the legend making process a number of words unknown to the younger generations surfaced in the discussion and a three-language legend was developed. The Mukogodo mapping has been a follow on on successful mapping of the Mau Forest Escarpment by the Ogiek people of Nessuit.